Whitney Vickers | Fairborn Herald The Air Force Marathon will take place Saturday, Sept. 16. 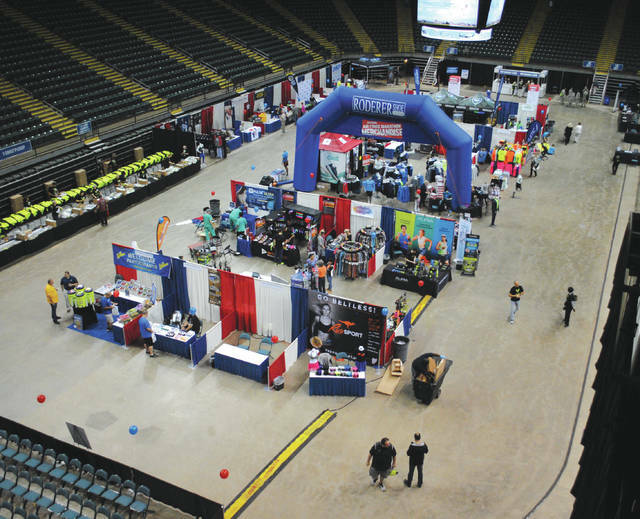 Events surrounding the marathon, such as the Sports and Fitness Expo at the Wright State University Nutter Center, have already kicked off and will continue through Friday, Sept. 15. 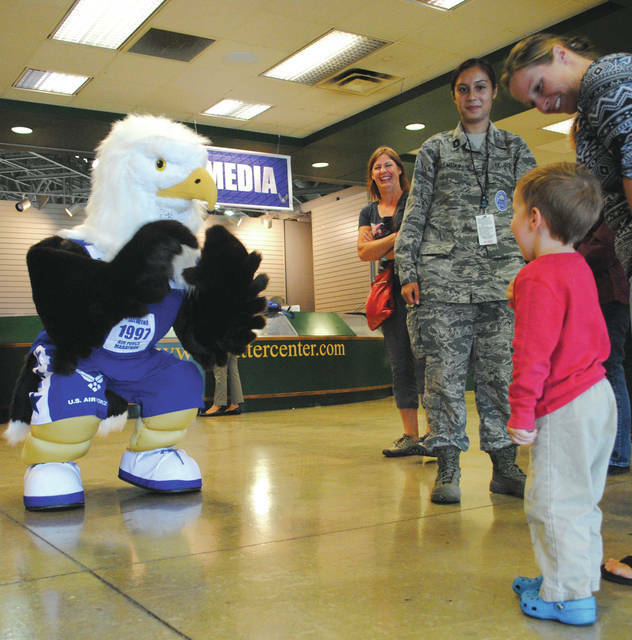 Tailwind, the Air Force Marathon mascot, greeting a young Sports and Fitness Expo attendee. 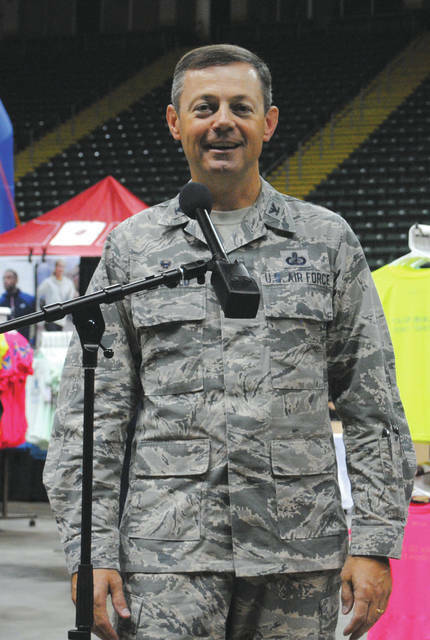 Wright-Patterson Air Force 88th Air Base Wing Commander Col. Bradley McDonald just before the Sports and Fitness Expo started. WRIGHT-PATTERSON AIR FORCE BASE — Tennis shoes will hit the pavement Friday, Sept. 15 and Saturday, Sept. 16 as part of the 21st Annual Air Force Marathon. The races include a 5K to take place 6:30 p.m. Friday, Sept. 15; 10K, slated for 7:30 a.m. Saturday, Sept. 16; half marathon, scheduled for 8:30 a.m. Saturday, Sept. 16 and full marathon, kicking off 7:30 a.m. Saturday, Sept. 16. The marathon also calls for a number of additional events to take place in spirit of the race, such as the breakfast of champions, Sports and Fitness Expo, gourmet pasta dinner, opening and awards ceremonies as well as an after party. Surrounding communities, such as the City of Fairborn are also getting involved with its annual marathon-themed events, such as the Fly Zone, allowing spectators to enjoy the race and cheer on participants from the downtown area of the community, as well as the pasta dinner at the Fairborn Senior Center. https://www.fairborndailyherald.com/wp-content/uploads/sites/50/2017/09/web1_1-4.jpgWhitney Vickers | Fairborn Herald The Air Force Marathon will take place Saturday, Sept. 16. Events surrounding the marathon, such as the Sports and Fitness Expo at the Wright State University Nutter Center, have already kicked off and will continue through Friday, Sept. 15.
https://www.fairborndailyherald.com/wp-content/uploads/sites/50/2017/09/web1_2-3.jpgTailwind, the Air Force Marathon mascot, greeting a young Sports and Fitness Expo attendee. https://www.fairborndailyherald.com/wp-content/uploads/sites/50/2017/09/web1_3-3.jpgWhitney Vickers | Fairborn Herald The Air Force Marathon will take place Saturday, Sept. 16. 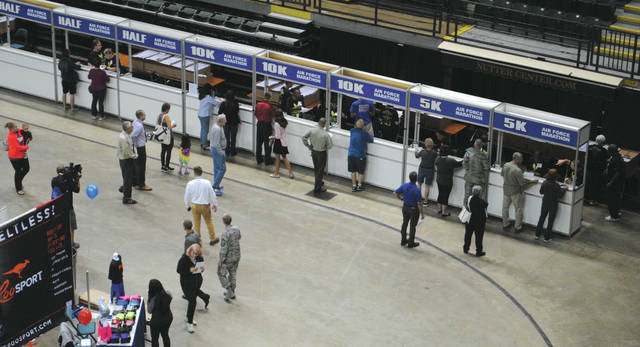 Events surrounding the marathon, such as the Sports and Fitness Expo at the Wright State University Nutter Center, have already kicked off and will continue through Friday, Sept. 15.
https://www.fairborndailyherald.com/wp-content/uploads/sites/50/2017/09/web1_4-3.jpgWright-Patterson Air Force 88th Air Base Wing Commander Col. Bradley McDonald just before the Sports and Fitness Expo started.